The life history and ecology of A. caucasica has been studied in detail by Hensle (1993), Nardelli (1993a, 1993b), Hesselbarth et al. (1995), and von Stetten (2002). Described originally as a subspecies of A. cerisy, A. caucasica was first given species status by Kuhna (1977). Hesselbarth et al. (1995) provided synonymies for A. caucasica (Type locality: Kutaisi, Georgia), including A. c. tkatschukovi Sheljuzhko, 1927 (Type locality: Sotshi, Caucasus), A. c. cachetica Sheljuzhko, 1927 (Type locality: Lagodechi, SE Caucasus), and A. c. abanti Koçak, 1975 (Type locality: Abant Golu, Bolu prov., Turkey). This species is distributed from the Black Sea and southern Russia (southern Caucasus Mountains) to Georgia and northeast Turkey (Hesselbarth et al., 1995). Larvae feed on Aristolochia pontica, A. pallida, and A. iberica (Carbonell 1996; Hesselbarth et al. 1995). In captivity, larvae also tolerate A. pistolochia and A. rotunda (Nardelli, 1993a, 1993b; Carbonell, 1996). Koçak, A.Ö., 1975. New Lepidoptera from Turkey. I. Atalanta (Würzburg) 6: 24-30. Kuhna, P., 1977. Über Allancastria in Kleinasien (Lep. Papilionidae). Atalanta (Würzburg) 8: 99-107. Nardelli, U., 1993a. 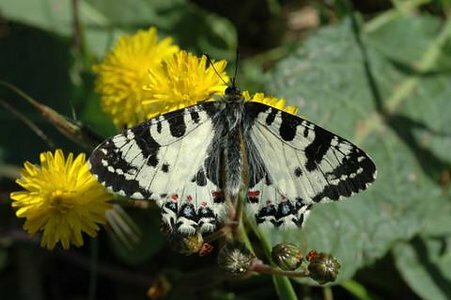 Bemerkungen zur Zucht einiger Zerynthiini und Parnassiini (Lepidoptera: Papilionidae). Entomologische Zeitschrift 103: 213-228. Nardelli, U., 1993b. 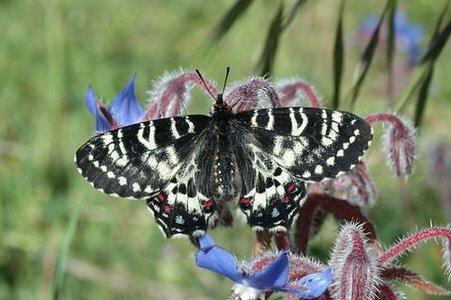 Zur Biologie einer wenig bekannten Zerynthiinae: Allancastria caucasica tkatschukovi Sheljuzhko (Lepidoptera: Papilionidae). Entomologische Zeitschrift 103: 409-428. Sheljuzhko, L., 1927. Zerynthia (Thais) cerisyi God. in Transcaucasien. Deutsche Entomologische Zeitschrift Iris 41: 197-204; Tafel III. von Stetten, M., 2002. Zum Sympatrischen auftreten von Zerynthia (Allancastria) caucasica (Lederer, 1864) und Zerynthia (Zerynthia) polyxena ([Denis and Schiffermüller], 1775) in der südwestlichen Schwarzmeerregion (Lepidoptera: Papilionidae). Entomologische Zeitschrift 112: 53-57. Page: Tree of Life Allancastria caucasica (Lederer, 1864). Authored by Vazrick Nazari. The TEXT of this page is licensed under the Creative Commons Attribution License - Version 3.0. Note that images and other media featured on this page are each governed by their own license, and they may or may not be available for reuse. Click on an image or a media link to access the media data window, which provides the relevant licensing information. For the general terms and conditions of ToL material reuse and redistribution, please see the Tree of Life Copyright Policies.